The user of the example can enter a directory in the Directory line edit. The contents of the directory will be listed in the list view below. When you have large - or perhaps even infinite - data sets, you will need to add items to the model in batches, and preferably only when the items are needed by the view (i.e., when they are visible in the view). In this example, we implement FileListModel - an item view model containing the entries of a directory. We also have Window, which sets up the GUI and feeds the model with directories. Let's take a tour of FileListModel's code. The FileListModel inherits QAbstractListModel and contains the contents of a directory. It will add items to itself only when requested to do so by the view. The secret lies in the reimplementation of fetchMore() and canFetchMore() from QAbstractItemModel. These functions are called by the item view when it needs more items. The setDirPath() function sets the directory the model will work on. We emit numberPopulated() each time we add a batch of items to the model. 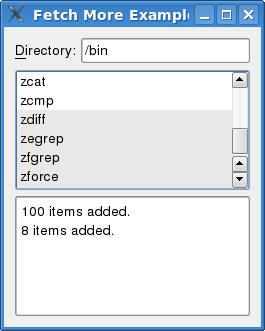 We keep all directory entries in fileList. fileCount is the number of items that have been added to the model. We start by checking out the setDirPath(). We use a QDir to get the contents of the directory. We need to inform QAbstractItemModel that we want to remove all items - if any - from the model. The canFetchMore() function is called by the view when it needs more items. We return true if there still are entries that we have not added to the model; otherwise, we return false. We first calculate the number of items to fetch. beginInsertRows() and endInsertRows() are mandatory for QAbstractItemModel to keep up with the row insertions. Finally, we emit numberPopulated(), which is picked up by Window. To complete the tour, we also look at rowCount() and data(). Notice that the row count is only the items we have added so far, i.e., not the number of entries in the directory. In data(), we return the appropriate entry from the fileList. We also separate the batches with a different background color.